In February 1968 planning permission was relieved for the first 33 shop units, 12 flats and 6 maisonettes. When complete a total of 48 units would provide floor areas of 4800 square metres for commercial use and 450 square metres for residential use. As a ‘comprehensive’ development, the Shopping Centre was to be the first of the public amenities designed to cater for the varied needs of the residents of New Ash Green. On an adjacent site to the north of the Shopping Centre SPAN proposed to build a public house, old people’s home, primary school, library, county clinic and church. An office block and community centre would be situated at the southern end of the Shopping Centre. It was hoped that the Shopping Centre would become a social focus of the Village and play an integral role in developing a sense of ‘community’. In 1973 Eric Lyons discussed of the planning of the Shopping Centre, ‘In all the master plans, we were struggling with the same problem: how to make the Shopping Centre an extension of the houses- how to avoid the trap of isolating the Shopping Centre with a car park moat which would have to be crossed by pedestrians’. The final Shopping Centre master plan elected to confine the movement of the cars to the periphery with parking situated to northern and southern entrances. This proposal would make the Shopping Centre safer and more accessible to pedestrians. The relationship between the design of the Shopping Centre and the houses was achieved by the continued use the mono-pitch roof, soft stock brick, blue/black asbestos tile and brushed aggregate walkways. The main pedestrian shopping street was called The Row. The northern side of the The Row, forms an arcade with ‘Upper Street North’ a second tier of shops, offices and restaurant above. The roof line of ‘Upper Street North’ is interrupted by a viewing tower. On the southern side of The Row the shop units are grouped in blocks of varying depth. Situated above these shopunits are flats. ‘The Link’ dissects The Row on the southern side and leads to a block of studios (accessed by stair) and large car park beyond. The space below these studios provides a covered ‘setting-down’ position for cars. The shops were to managed by the Centre Society, comprised of the shop tenants. Looking back in 1973, Eric Lyons described the high expectations he had for the Shopping Centre, ‘We thought that the place could become a kind of ‘out-of-town’ shopping centre because there is very little good shopping for miles around. So we set out to achieve a wide range of good quality shops’. The first classes at New Ash Green County Primary School were held in September 1971. A ceremonial opening was held in June 1972. The school was to have been SPAN’s first County building. The Kent County Council’s decision to transfer the School to the 1969/70 building program and disagreements over the sale price of the proposed site for the School contributed to severe delays. By the time classes had begun in September 1971, SPAN had already withdrawn from New Ash Green (see ‘SPAN in Difficulty’). Eric Lyons and Partners remained as the architects of the School, now employing the services of another developer. Externally the design relies on the features and materials common to the earlier SPAN built buildings in New Ash Green; mono-pitch roofs, soft stock brick and vertical wooden weather boarding. The site was landscaped and planned to include playgrounds, climbing frame and swimming pool. The first phase of the school included 8 classrooms, staff rooms, offices, kitchen facilities and assembly hall with distinctive triangulated skylight. Once the second phase of the building was complete it would separate to form an eight class Infant and twelve class Junior School. The interior relied on the principle of open-plan. Units of ‘doorless’ class rooms faced onto central activity areas and enclosed quiet rooms. Only one unit of 6 class rooms and one partially complete unit of two classrooms were built as designed by Eric Lyons and Partners. The second phase of the School was based on a modified version of Lyon’s original design. 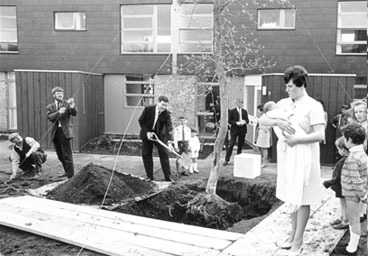 From November 1967 the first families began moving into the first SPAN built neighbourhood-Over Minnis. As more people arrived a definite ‘community’ spirit begun to evolve. Many of the early residents were under thirty with young children. They came from a diversity of backgrounds and different parts of the country. Many clubs and societies were formed by these ‘pioneering’ residents They included a wives group, tennis and football clubs, brownies and guides,cubs and scouts troop and film society. 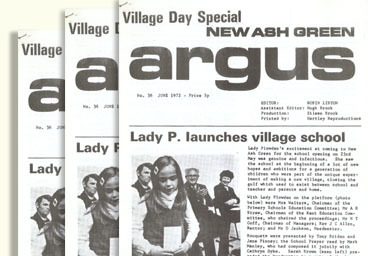 In May 1968 the first issue of the village journal the Argus was produced. It was edited by a resident of Over Minnis and included news of SPAN’s building progress, details of the activities of the various clubs and societies and a letters page. To commemorate the birth of the first child in New Ash Green in 1968, SPAN planted ‘Richards’ Tree’ (a 25 foot Italian Alder). At the foot of the tree was placed a portland stone cube with the inscription ‘Richard’s Tree’. Originally intended as a temporary home, a SPAN built hut on Punch Croft became New Ash Green’s nursery in February 1969. ‘It was like a social experiment as much as an architectural experiment and that was what attracted me to it. It was something quite new socially. This was a totally new concept and was very exiting. We couldn’t wait to get in! From day one there as a common endeavour to advance the social life. There was a party once-a-week in the Manor House which welcomed new residents. On the first day that we moved in, two or three people called at the door to see if we needed anything needed any help. These were people who had arrived maybe a week before. So you had a tremendous community feeling about the whole place’.J.Harbinson, Punch Croft. To celebrate the official opening the Shopping Centre, SPAN organised Village Day. Host for the day was Pete Murray, the Radio 1 disc jockey. A no-expense spared event it included a rodeo show, flying display, Morris dancing, Punch and Judy show, stalls and various sideshows. Two live bands provided the musical entertainment for the evening ‘Dancing in the Streets’ party. It was decided that Village Day should become an annual event. 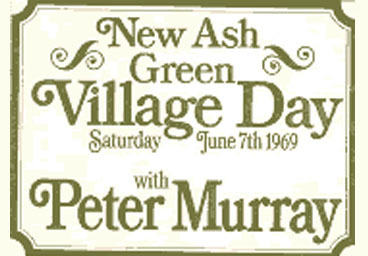 The second Village Day in 1970 was coordinated by a group of residents who had formed the Village Day Committee. In recognising the wider role of this organisation, in November 1970 it changed it’s name to the Village Social Committee. In May 1968 the first issue of the village journal the Argus was produced. It included news of SPAN’s building progress, details of the activities of the various clubs and societies and a letters page. To commemorate the birth of the first child in New Ash Green in 1968, SPAN planted ‘Richards’ Tree’ (a 25 foot Italian Alder).